Little need be said of of the life and career of the man most will agree is one of the greatest composers of the Western tradition. 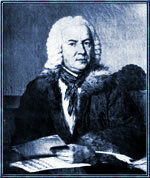 Bach's music represents the culmination of the North German Baroque style, revitalized with key elements of Italian and French music and a pervasive contrapuntal technique that Bach's contemporaries branded as "old-fashioned." Though a prolific composer of sacred choral music, there is little in Bach's output that was meant to be sung a cappella (that is, without instrumental accompaniment). Even the compositions designated "motets", deliberately composed in an anachronistic polyphonic idiom reminiscent of 16th century stile antico, demand a minimal continuo accompaniment. However, his 4-part chorale settings, long admired as exemplars of his art, offer choirs both challenges and rewards when sung a cappella, whether it be as a rehearsal exercise, a service occasion or in concert.